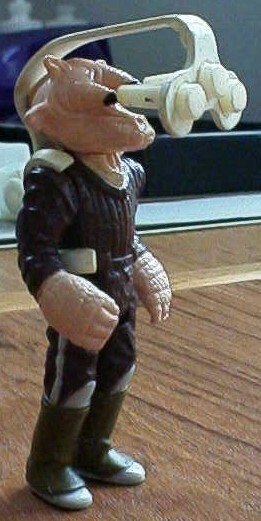 This vintage figure was a concept late in the original Star Wars figure line. 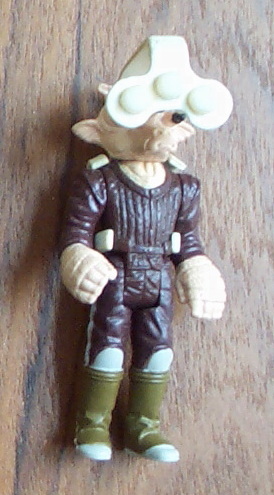 The theme in this series of designs was to add accessories to figures that had already been in production. In this case, the Ree Yee figure received an impressive backpack-mounted binoculars (or trinoculars if you will). Of course, Ree Yees with trinoculars never went into production and likely remains a one of a kind example. This piece is made by hand entirely out of styrene.